Tonight's red post collection includes the March 2nd mid patch update, Meddler with another set of gameplay thoughts including details on Lucian's PBE changes, Rumtumtummers with on upcoming Nexus site updates, a new pocket picks on Froggen's Anivia, and more! The official 7.4 patch notes have been updated with a mid patch update that went out to fix issues with the Meditation mastery and minion pathing. BUGFIX - Fixed a bug where Meditation was granting more mana regeneration than intended"
Meddler has jumped back on the boards to share his quick gameplay thoughts for March 3rd, including a look at the current PBE changes for Lucian, SGU audio fixes, and more! Usual deal, bunch of things we're thinking about right now below. As usual, this isn't a comprehensive 'everything going on' list, just stuff good to talk about today. Our intent for single target, click to hit spells is that when they're cast they reveal the caster if they're in FoW/brush. That gives a bit of extra counterplay (against the champion, not necessarily the spell itself) to those abilities and improves clarity of what's going on at the same time. We've got a fix for Jhin Q in the next patch that makes it so that he is now correctly revealed on cast as a result. Mentioning this in particular since if anyone's aware of any other similar spells that don't have that reveal attached a mention of them would be much appreciated so we can give them a look, see if they should. Post cast lock on both Q and W should now be able to be consistently overridden by other actions (attacks, movement, spell casts) rather than sometimes requiring multiple clicks on a target, clicking to move then clicking to attack etc. Linking this post from WookieCookie yesterday for anyone interested that didn't see it. Short version is that our rules and approach around how trade offs between unusual/experimental gameplay and team interaction get handled need refinement. We'll be looking at that internally next week, hopefully be able to bounce some ideas off you folks soonish after. We've got some fixes for some broken (not playing) audio lines on SGU. Not sure if those made the upcoming patch or if they'll be in the one after, yesterday was lock day for 7.5 and uncertain if they made it into before the lock or not. Looking back through Udyr's file history it looks like this is an issue that's cropped up multiple times for him. Along with making it so the lines play as they should we're also looking at a better structured way to call those lines in the first place so this doesn't happen again." Well, looks like I'm bad at numbers as well as words early morning. I can't edit that thread title alas so I guess we'll be stuck with that today." "We're working on a hotfix at the moment. Not sure on exact timing yet, but pushing to get it out as soon as we can. Edit: Context for anyone confused now that the original post's been removed by its poster - a bug that can be exploited for meaningful power." We used the GA visual effects because they made it really clear when Aatrox was/wasn't able to revive since we're used to seeing them associated with the same functionality on GA. Imagine we'll take a look at doing a somewhat customized version whenever we do a larger Aatrox update if the update still has a revive on the kit." Wait...but he already has revive animation where he falls onto his knee and starts to regenerate health, no??? The animations while he's reviving should be the same. The visual effects that he has the revive available (while he's running around, hitting stuff etc) are what looks like GA."
The patch the current Aatrox changes are in got locked yesterday (we can't make any more gameplay changes to it). Intent with it however wasn't 'this'll put Aatrox in a good spot where we can leave him' but 'this will put Aatrox in a less bad spot until we can update him properly'. That larger update, whenever it happens, will definitely look to do things like better incorporate his lore, make him more distinct from other similar champs etc." "The Aatrox balance changes will be in next week's patch, yes. Morde's fairly high priority for a full update, there are others that will definitely be out before him though (e.g. Galio, Urgot, Evelynn) and some others around the same potential level of priority (e.g. Nunu). A full update would include a new model certainly." Any followup for the Cho'gath changes? His winrate still remains amoung the bottom. The nerfs to ap ratio and hp towards the end of the pbe cycle seemed excessive and he still needs a faster cast time on his spells. I believe we'll be looking at him in 7.6, not sure what yet though." Now that you've been able to obtain some good hard data on how strong Quinn, Talon, etc. are with Lethality being nerfed, what does the team think of their current strength? Have you decided that nerfs might still be necessary, or have you come to the conclusion that they're in a good spot now (again)? Still assessing. Quinn looks like most likely to still be out of line, Panth, Talon less so. Jayce unclear." Meddler, could it be possible to look into the Karthus audio bug that is very similar to Spirit Guard Udyr's taunts? All special lines for Karthus (items purchased, first movement of the game, ward placement) are mute, and he only speaks his movement, spell and autoattack quotes. It's been happening for three patches now, and it'd be really nice if you looked into it. Thank you SO much for these gameplay thought posts! Edit: Pretty sure I found the issue. Thanks for the report! " Any theories as to why Master Yi's winrate jumped this patch? Nothing concrete yet, though we're also seeing Udyr's win rate spike up noticeably on sample sizes big enough they should be meaningful. Potentially same indirect cause (meta shift/changes to other champions?)." Instead of an Ask Riot for the week, Rumtumtummers posted an update on Riot's NEXUS site including a few new features and languages that will be hitting the page soon! "It’s been about five months since we launched Nexus, and in true Riot form, we’re Still In Beta. Since there’s no Ask Riot this week (most of the folks who typically answer Ask Riot stuff are off at GDC), now seemed like a good time for a brief update on what we’re up to and where we’re headed. So. Let’s just dive into it, yeah? We stuck the beta tag on Nexus at launch to indicate what you were seeing then wasn’t the final version of what we intended to make. Most of the work done since then was on building the backend (at launch, Nexus posts were hard-coded—now we actually have a CMS), but we’ve also shipped a number of small quality-of-life updates. 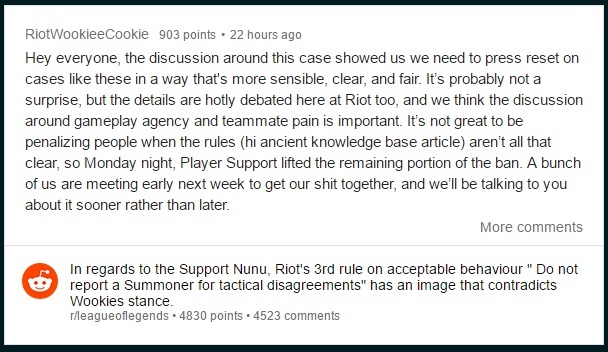 Ask Riot moved to Nexus! Search! On a League of Legends website! These new elements will go live whenever they’re ready—it’s not a one-giant-update kind of thing. Once they’re all up and running, we’ll remove the beta tag (take that, Mac client!). One of the biggest bummers about the current iteration of Nexus is that it’s English-only. While the content still follows the normal localization pipeline at Riot and ends up published globally, only English-speaking regions have the full Nexus experience. We knew starting with English would be the fastest way to get going and test content, but it has always been our intention to bring Nexus to every region. Once 2.0’s features are live and functioning (which I expect/hope will be before the end of March), we’ll focus all of our efforts into getting Nexus localized and live in other regions. I’m not sure how long this will take, but it’s going to be the editorial team’s #1 priority. I do have to apologize here—we had intended this to begin much sooner but ran into some technical hurdles with the backend that slowed us down quite a bit. Hopefully we’ll be able to do the regional versions right and fast now that we’ve learned how to do it wrong and slow. That’s pretty much the gist. We’ll keep you posted as things change or don’t change, and Ask Riot will return to its regular Thursday time slot next week. Thanks for hanging out, and thanks for reading/watching/asking/commenting. And please, if there’s any type of content you’d like to see on Nexus, let us know. We can’t do this without you." 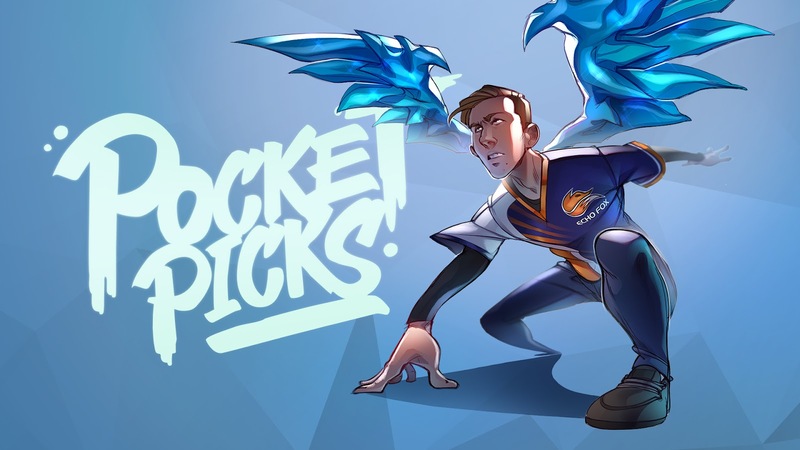 A new pocket picks is up, this time focusing on Froggen's Anivia pick! "Pocket Picks is a series where pro League of Legends players share tips and tricks to help you master their favorite champions. This episode features Echo Fox's mid laner Froggen showing you how to fly high and get the most of his Pocket Pick, Anivia. To learn how to pull off some Anivia tricks that Froggen's done over the years, head to http://www.lolesports.com/en_US/artic..."
New episodes of the The Penta, Mic Check, and This or That as we kick off LCS week 6! "Want the best plays from around the world? Don’t worry, we’ve got you covered, with this week’s latest episode of The Penta. This week, we’re jumping in the pit and counting down the best Baron steals of the season so far." "Mic Check is here to take you behind the screens and give you an inside look at the players’ comms during your favorite games. This week, we take a look back at the series between CLG and TSM from week 3." "Jatt and Kobe return for This or That, the show where the slides are made up and the points don’t matter. Each week they’ll be back with fresh slides (which they've never seen) and will argue whether it’s “This” or “That”."